This one is a complete enigma. A single, bankrupt Mission suddenly became an “ideal org”. For no good reason. Staff were imported from around the world and Miscavige displayed his ribbon yanking prowess for all to see (well, “all” being scientologists only, who had to be flown in for the occasion to make it look like there were at least a couple of hundred interested enough to pay their respects). Now, reality has set in. Someone alerted me to their Facebook page where they are trying to get people to use their auditorium. This posting has ONE comment (from an Italian?) and a grand total of 19 reactions. I didn’t even bother trying to find out how many were yellow “OMG” faces and how many were “thumbs up” and “heart” emojis. Even if it was 18 positive to 1 negative, that is so few to be irrelevant. One would have imagined that they would have used a shot that had more than 10% of the seats filled. More evidence of worldwide ideal org fail. Who may be getting £20/week if they’re lucky. Did anyone notice the young women in black dresses with their backs exposed? Do I see their ribs and backbones? Are they starving scientologists? Or is their picture distorted? Church of Scientology Dublin’s unique auditorium is now a coveted venue for Europe’s hottest and most cutting edge events. With its wooden stage, podium and grey chairs, everyone is vying to rent this space. Word is out that A & E Network has just successfuly concluded intense negotiations to rent this Ideal Auditorium for its upcoming Aftermath Part III. The venue for the next televised Aftermanth would be THIS auditorium or NOTHING. Consequently, a very high amount was offered by A & E to rent COS Dublin’s auditorium, an offer so astronomical that Scientology’s Ecclesiastical Leader David. Miscavige simply could not refuse. “COB” as He is affectionately called by His parishioners, was so pleased and impressed by A & E’s lavish rental offer that He brushed off objections voiced by His staff who cautiously pointed out that Aftermath’s stated purpose was to expose the crimes of COS, L Ron Hubbard, and Mr. Miscavige himself to the world and possibly eradicate Scientology altogether. So delighted was COB that He offered the A&E crew free dessert refreshments throughout the filming, all catered by his professional culinary staff technicians. Along with the assurance that all proselytizing about the religion would be strictly enforced, Mr. Miscavige closed with his warm injunction to , “Leave the E-Meters, take the cannolis”. Looks like Ireland will be forever Celtic not Cultic. I wonder if the posh empty Ideal Orgs are really for just the rich Scientologists and celebs, who breeze into that town, and wish to plop down at the local org, and have their org/lounge and maybe take a moment breather, and the emptiness would suit the celebs wish for privacy, LOL. Trophy org/lounges for the rich/celeb Scientologists. They are the ones paying for the places. Scientology as a subject is all about Xenu, since OT levels 3, 4, 5, 6 and 7, the top confidential stuff, is all about exorcism which Scientology can’t publicly admit they even do all this exorcism of Xenu’s dead alien souls that Xenu had those souls (“body-thetans” and clusters of “body-thetans”) given all the R6 pastlives implants, the “OT case” handling takes a lot of years for Scientologists to get rid of all of their Xenu’s “body-thetans”. And the posh org/lounges don’t have any threat of public bugging the rich/celebs, they are so empty. Privacy for the in club with money. Mike, in this respect, Dublin is not much different than Nashville. When I first joined staff they were a city office in a rented dinky house over in Music Row. At the time they were finishing work on the Fall School building where they are currently located. It was another example of Dave turning a pittance of a small group into an ‘ideal org’. There were times when I was on staff that I often wondered to myself ‘ How in the hell do they pay for this?’ Not a lot of people came through the doors and the only public were the old timers who often groused about having to donate to this or that. Renting out your Cult’s theater is another great data point to show systemic Ideal Org fail globally. The next thing will be to hire out SO as charmaids, chimney sweeps, horse-shoers, and telex repair technicians. Maybe someone will inquire about holding a psychiatric medication convention there, with free samples of ritalin for the technicians. I’m sure if the fees were paid in advance, no problems. Do they sell Amway and Herbalife in Ireland? Lots of empty chairs in that auditorium. Empty chairs, eh. That must mean more fundraisers. And the few people in those chairs are asleep. Their auditorium is “fully staffed with professional technicians”? What the Sam Hill does that mean? Dublin Org staff are somehow jack of all trade professional technicians available for any kind of event? What BS. Here’s what I’m hoping it means: That the SO staff is at their disposal to run the light boards, special effects, curtains, whatever is needed for the outside event people who rent the auditorium. If that is so, then I hope the SO gets to talking with the people they are interfacing with, and they hear how good conditions are at the job just like what they’re doing, how they get good pay, days off, paid vacation, paid for health insurance, friendly people security, etc. Then maybe a few or more SO will blow. Or maybe some of the people they interface with start asking questions, like “is it true that David Miscavige does…. I saw it on Leah Remini’s show.” It might get them to start questioning and looking. Absolutely. The more SO communicate with Non SO the better. It takes the ability to be able to turn on a light switch after opening a locked door, hence you’re a technician. Wana bet there’s a TWTH booklet on every seat? I’m still working on the light switch thing. I’m not the sharpest nife….ummm, I mean knife in the chandelier. Drill, drill, drill. Keep working that index finger on the light switch again and again until you can do it flublessly. The most successful light-switcher-onner groups have always been tough, dedicated light-switcher-onner groups. We’re not playing some minor game here.. Replace that wandering gaze with a tough, dedicated glare and you’ll win and we’ll all win..
For those of you who need translation “fully staffed with professional technicians” is “if you pay to rent our auditorium, low paid staff members who have no idea what they are doing will be forced to help you pull off your event or they will be declared”. What’s M-7 thing? Are you and Valerie speaking in code? Some sort of grenade launcher perhaps? Oh, I beg your pardons, Blog Buddies. “M7”, short for “Method 7, is Scientologese for a type of “Word Clearing” done wherein a student with a misunderstood is not required to look up the word in the dictionary but is simply given the correct definition verbally. Let’a all chip in and rent it for a run of Cathy Schenkelberg’s great routine “Squeeze My Cans.” I mean, how could they turn down a booking for a light comedy/dark drama show by a successful Scientology* actress, a veteran of 14 years on the cans? * the concept of ‘former but never again’ fits in this description somewhere. Maybe they could rent the space out to a local church that needs a larger auditorium for Sunday services. And the scam goes on ……. I enlarged the photo, and the first thing I noticed was a trio of barebacked girls to the lower left. There are a smattering of similarly dressed kids around. 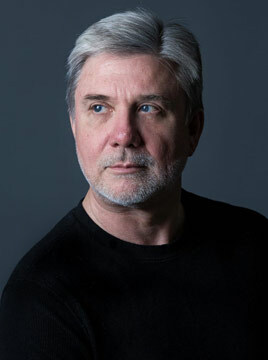 Having been a dancer in a former life (wink), it looked to me like a dress rehearsal. I googled “Art in Motion, Legacy, Dublin,” and it does appear to be a dance event, not a scio event. Man is caught in a huge and complex labyrinth which I created. To stay in it requires that he follow the closely taped path of Scientology. When Lubbotard used the phrase ‘Safeguarding Technology’ I think he meant finding new and better ways to protect the money he had stashed in safes all over the place. A tradition Diminutive Miscreant has carried on to this day. 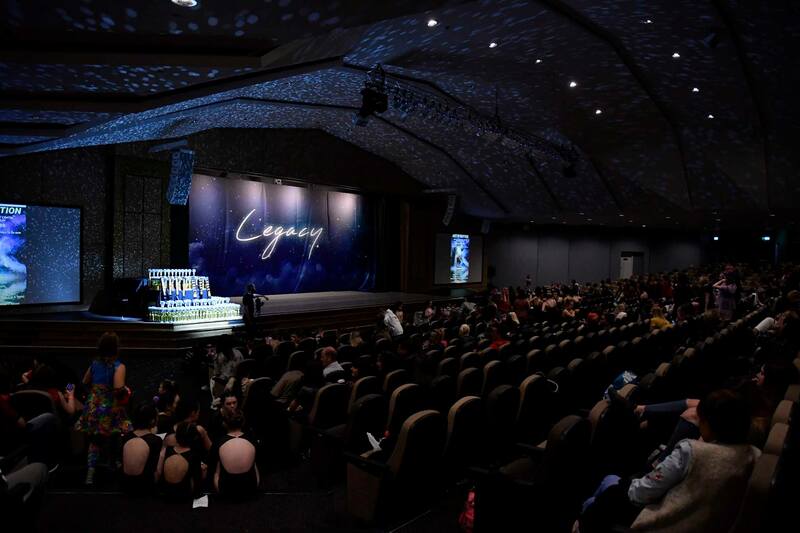 Actually that’s a non-Scn event – a dance award ceremony held on April 22, 2018. The picture was probably taken before the event started. There’s another one coming up in July. Unfortunately, Miscavige’s billion bucks will ensure that, at least theoretically, the lights can stay on in every org for a long time. I say, “theoretically” in that if there are no more public and no more staff it would of course be absurd. But if the last Still In left the building today, he could still keep these orgs open if he were so inclined. Of course, all WE care about is getting them OUTTA there. But, if too many staff and public flee and the Dwarf believes he still has to keep the Smoke and Mirrors Show going, he could afford to do it and all he’d have to do would be to actually PAY people to be work there, even just a Receptionist for each org. I wouldn’t put it past him. Renting out the Auditorium of Lron is just another attempt to safe point Ireland. Given the widespread media coverage of the proposed NarCONon and the many stories about $cientology, I see a major fail in everything the local Clams do. As there is nothing around the mOrg, how can they rent out parking like Denver or find some real profit making business to keep the lights on? I can see it now, Micheal Flatley and Riverdance troop doing a dancing tribute to Lron. Tickets at the door. And Michael Flatley won’t be there, nor the Riverdance troop, just 2 Nigerians and 1 Ukrainian who can’t actually dance. Are there any local Clams? Everyone at the Dublin mOrg seems to be from other countries. Where is Ireland’s Donny Rump? They need to get a handle on those pesky foreigners. Our publics’ gone, the silence is so galling. Its You, its You, must come and must not hide. Oh Sheeple Boy oh Sheeple Boy we need your dough. I’m confused. Is Firhouse supposed to be an Idle Morgue as well as a ‘community centre’? They have their original crappy premises above a shop, plus a grandiose terraced building doing double duty as some kind of creepy embassy and secret service HQ, and an old folks home they’re converting into a drugs rehab no-one will visit. Plus this overblown Firhouse community centre (completely ignoring the fact that the local community already has their own community centre, thank you very much). Quite a bit of overkill for an organization which has about 87 local members. Do they still have the old Dublin mission premises? As noted in another comment, I can’t find any sign that it still exists – and it’s not on Scientology’s website any more, as far as I can tell. I hadn’t gotten the impression that they were going to shut it down when they opened the org, but it seems as if it’s either gone away or is on its way out – the mission holder, if there still was one, was certainly going to be left without much if any business. Inglewood (CA) and Harlem are both also double-billed as “Community Centers.” I’m not sure what is supposed to be so special about them, except that I think they are all somewhat oversized – and located where the communities are least accepting of them. April example: from their Facebook page: MEGA FAMILY FUN DAY TO CELEBRATE OUR FIRST 6 MONTHS! There were 16 people there.Seemed a HE. Attendance at at other events seemed less. A huge fail. Desperately asking for a-n-y-o-n-e to come and hire their expensive venue is a sure sign it is sitting empty. And what does Scn Community Centre even mean? Are they just being community do-gooders now and not delivering scn tech? I wonder if the staff will pad their ‘bodies in the shop’ stat with this. This is great! Between this news of a second ideal org fail, Tony O’s post about the mandatory imperative that All staff keep themselves informed and stay up-to-date by watching all programs aired on $ Network, and today’s post on yet another $ shill being charged by the courts (also on Tony O’s blog), the Rabid Runt Has to be feeling the pressure. I’m seeing mental images of the last scenes of the 1953 film War of the Worlds where the alien ships are crashing . . . one . . .by one . . . by one. . . . . I wonder how long it will take DM to burn through his one billion and change with this Ideal Org scam Mike? Flying people from country to country will add up quick. Ha! No crisis here. The whales will just keep replenishing the coffers. I wonder if they would rent it out to me so I can holding a viewing party for the premiere of Season 3 of Scientology The Aftermath…..
there are half a dozen women on the lower left all in the same open backed dress – i’m assuming some type of entertainment group?? I know in the bigger scheme of things that observation is really nothing but it caught my eye as odd for some reason. I ‘m thinkin ya need to git into this AI thing a bit more. Yep, we all know you have artificial intelligence, I mean most everything about You is artificial (although not very up there on the intelligence side of the graph) but if You invest some of yer billions into some AI props think of the possibilities. Events would be maxed out with raving artificial intelligence and just think of it, those bots could do the stand up, sit down routine ad infinitum without even needing food, water, or sleep. And You could pre-program the timing for those oh so wonderous standing Ohs!!! And, you would be able to fill up those empty seats Dave. Do the math. You buy 3000 bots at 250K apiece and it only consumes about 3/4s of a million. You’re there good buddy with change left over. Program em up, add in some neat features like good Tee Are skills with the space stare (keep WD-40 on hand for the knee bend thingy) and all that stuff and You have sold out events good buddy. And You don’t need to buy that cheap finger food for after the events while yer staff buzzards circle the drain. A lie, a lie, oh! Bravo, bravo, Visitor. You just keep outdoing yourself! Renting out the hall sounds like a good idea. They can count anybody who shows up as a “body in shop” stat, and they get the hall rental on gross income. 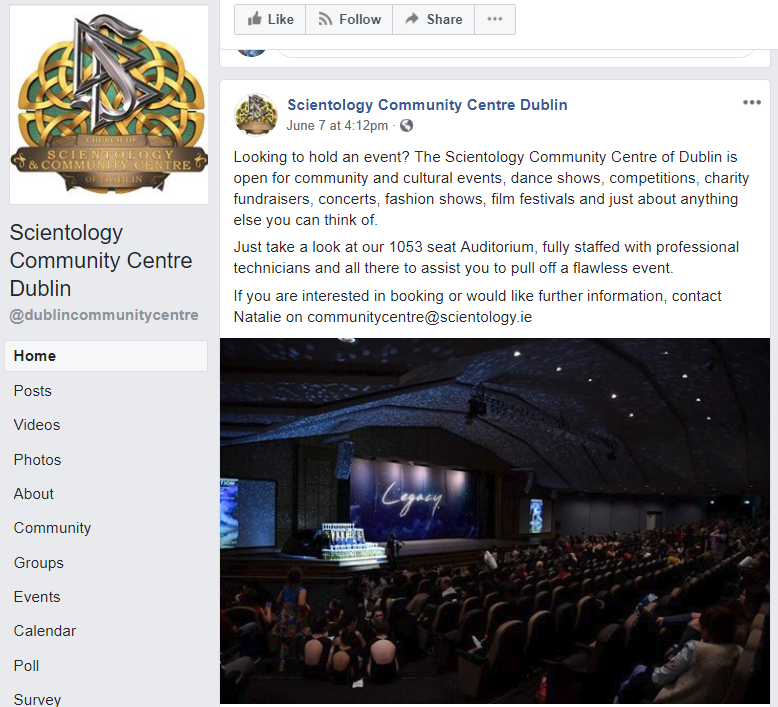 Of course, anybody from the outside in Ireland is well aware of Scientology’s reputation, so nobody in that country would ever actually want to book the auditorium for their event. But in a way, this attempt to beg a few pennies from the wogs is better than what they do in Denver — they are forced to renting out the parking lot on baseball game days for the nearby stadium. By the way, since that’s all cash, I wonder how much of the proceeds from that desperate fundraising exercise make their way into the pockets of the desperate staff. They will hold events there for other organizations and churches…then send GOLD to take photos and then feed the propaganda machine … SuMP…. the photos to fool the sheeple. It is very predictable how Scientology scams, deceives and bamboozles the sheeple into BELIEVING because they cannot admit they have been tricked. They should name it the David Mayo theater. I guess Natalie, the girl that sent the message, is just trying to get some income so staff can eat or something like that. So, no matter how much applause and admiration Miscabage gets at the MV while showing all these false videos of Ideal Orgs; deep inside he knows all is a lie and he, a failure as a human person. In reality he has no power. I don’t think you’d have to go very deep, Silvia. The Dwarf has no shadow of a doubt about the fraud he’s perpetrating. that is one serious financial boat anchor. So who pays to keep the lights on? Hydro and municipal services are expensive in the Republic. James, in each org however tiny it may be there’s usually a whale or two who get hit up for stuff like this. It hadn’t been clear to me whether the mission, the Dianetics and Scientology Centre Dublin, was going to be left open – and presumably to struggle even further, in the face of the new org taking away any really good business – or merged. Technically, since they’re supposed to be “expanding,” an org should be spawning a network of missions, not absorbing them – or letting them shut down and vanish, which is what is happening with most of them around the world. I can’t find a conclusive answer in this case, but it does appear that Dublin mission is now closed, though it’s possible that the mission holder just threw in the towel. lt might also have been one of the many cases where the long-term mission holder became elderly or passed on and the fate of the mission was up for grabs; I’ve never seen any detail about exactly what was going on, but typically for Scientology there is probably some convoluted if not even ugly backstory. The new org was named the Church Of Scientology And Community Centre Dublin, and if I recall, part of their attempt to paint themselves favorably and placate the locals, was to position the facility as something that would be available for use by the community. I doubt anything about the org and its operations is working out as claimed or expected, as there are almost no scientologists in Ireland, and the Irish seem very unfavorably disposed towards something like Scientology. That’s what gets me. Dave really thinks that he can get all those devout Catholics to come flocking to Scientology? That’s why he’s called DM. Maybe Ireland has certain tax shelter reporting rules that favor dropping cash there? Probably only France & Germany is less friendly to scamology in that part of the world. Oops! Someone’s going to be in trouble for not photoshopping the same 50 people over and and over into the empty seats.